Time’s too precious to wonder if tasks and projects will be done on time. Or worry if your frustrating co-workers will do a sloppy job because they’re not accountable to someone for the quality of their work. Also, a global survey of 38,000 people found that ineffective meetings are one of the top three corporate time wasters. According to the manager spends up to 23 hours a week chit-chatting in rooms with others, yet more than two thirds of them believe meetings aren’t productive! My team have meetings like any other organisation, but with Mike and I out facilitating workshops, it’s critical we guarantee a method for defining responsibilities and ensuring action afterwards. We use ‘RASCI’. 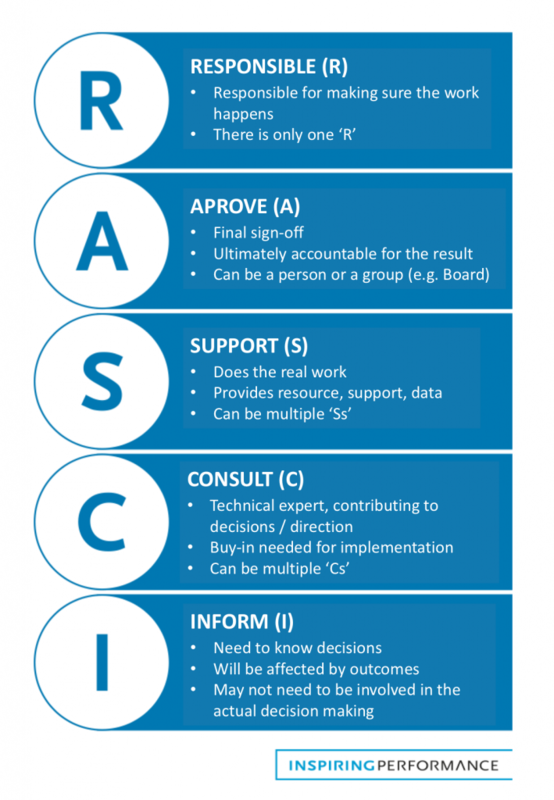 It’s a great tool we’ve embedded into our strategy programme to help with implementation. But of course it should be used for day-to-day tasks and meetings as well! The descriptions in the image are pretty clear, but here are a few things to keep in mind. • Different perspective and others’ opinions (‘C’) can be great, but be sure to make it clear to them (say the Executive) if your only wanting their opinion. They’ll often assume they are the Approver. • Progress might happen faster if there are less people getting involved. If it’s clear they’re involved but will learn more later (‘Inform’) it’ll be easier to tell them to back-off. Losing productivity on something as simple as mixing up who is doing what is a ‘peak performance crime’. Create time by asking “Who is the ‘R’?” at the end of your next meeting!